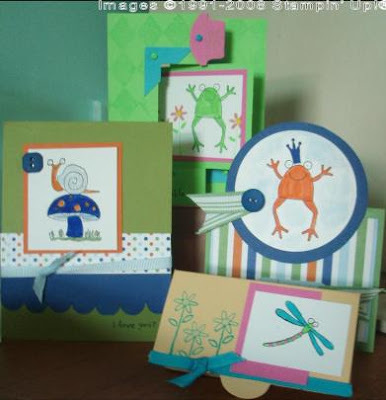 Lily's Ink Pad: Stamp Set of the Month Club---Unfrogettable! Unfrogettable is truly an unforgetable set. I will miss it grandly. You can check out my feelings about this set here. This month's Stamp Set of the Month Club set is UNFROGETTABLE. from 10-12 pm or 6-8 pm. You choose the time that works for you. You can also opt for a kit to mailed to you. At the class, you will receive all the materials you need to complete 4 cards, a 3D item, and a scrapbook page plus instruction. By mail, everything is precut and ready to go. If a part needs a tool, I'll prepare it for you. Stampers fee is $30 with $8 if you choose shipping. Email me to register by July 9th for the class or July 31st for stamps by mail.